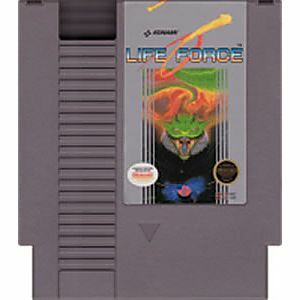 Life Force original NES Nintendo Game cartridge only - Cleaned Tested and Guaranteed to Work! Unless your buying bayou billy,It's a Konami game for the NES,you want get it.For the price,you can't beat it.Its a space shooter,It's Konami,own it. Lukie sent me this game and it came looking like brand new I couldn't believe how nice the label looked. And, as was often the case with Konami games on the NES, this one is a toughy. The thirty-life code is almost a necessity, at least when you're first starting out. Your mission is simple. You've flown your spaceship into the body of a gigantic alien known as Zelos, a creature whose favorite food seems to be planets. Yes, you heard me right, planets. Your goal is to fight your way through six action-packed stages, each overseen by a gigantic boss monster. Your final goal is to destroy the heart and soul of Zelos. The catch is twofold. First, as with most NES space shooters one hit means instant death, although the game is somewat merciful in that you start right at the place where you died, at least until you run out of lives. The other catch is that if you reach the final battle and destroy one part of the last boss but not the other, you'll be sent back to fight your wayy through level four, five and six again, always assuming of course that you survive the game's final trap. If you completely destroy Zelos, you of course get the true ending, again always assuming you get past the very last trap. As with a lot of NES Konami games, this one features an amazing soundtrack. It also doesn't suffer from what I like to refer to as NES syndrome, which is a fancy way of saying music recycling. A lot of NES games tended to recycle music from earlier stages when you began to get close to the end. 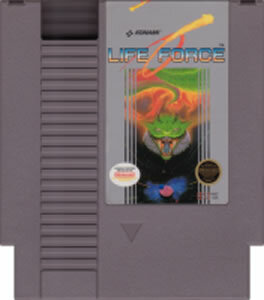 Life force does not do this, although there is just the one boss theme. Each stage features its own theme and all are quite catchy. The sound effects, too, are quite cool. Needless to say this is definitely a game worth adding to any NES collection. This was an awesome game and worked really really well. Space Shooting at its Best! 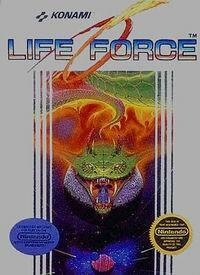 Life Force is your classic side scrolling space shooter. This game still holds up extremely well today for this genre of game. The game moves at a great pace, constantly keeping you on your toes, and has a great way of upgrading weapons. Levels shift around you creating unique levels. The music is decent and the control is perfect. The game is also 2 player which only enhances the fun and experience of this perfect retro space shooter. The difficulty is strong, but with patience and precision, you'll have no problem.